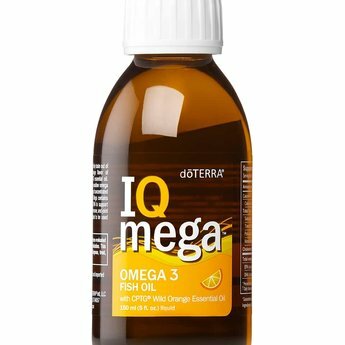 dōTERRA IQ Mega takes the fishy taste out of fish oil and puts the fresh orange flavor of dōTERRA Wild Orange CPTG® essential oil in this great tasting and easy-to-swallow omega-3 supplement providing 1,550 mg of concentrated, omega-3 fatty acids per serving. IQ Mega contains the essential nutrients DHA and EPA to support healthy brain, cardiovascular, immune, and joint function. * IQ Mega is formulated to be used daily by children and adults with dōTERRA a2z ChewableTM tablets. The Omega-3 nutrient DHA is essential to support nerve cell communication throughout the brain, eyes, and nervous system. * As a determinant of brain growth and performance, DHA promotes normal memory, concentration, attention control, alertness, and positive mood. * A constant supply of DHA is also required for the retina and macula to deliver healthy vision. * The many roles of DHA make it one of the brain’s most important molecules. Restoring the balance of omega-3 to omega-6 fatty acids is an important step in keeping your body healthy. This can be done by decreasing your intake of foods high in omega-6 fatty acids and increasing your intake of foods that are rich in omega-3 fatty acids. Fish is an excellent source of dietary omega-3 fatty acids, but omega-3s can also be found in canola oil and the oils of some nuts and seeds. One daily serving of IQ Mega provides a total of 1,550 mg of pure, micro- filtered marine lipids, including 900mg of DHA and 400 mg of EPA. Because of growing anxiety over the levels of toxins and heavy metals present in many of the world’s oceans, daily fish consumption as a source of omega-3 fatty acids is not acceptable to some consumers. As a solution, IQ Mega essential fatty acids are tested extensively to ensure the oil is free of toxins and heavy metals.